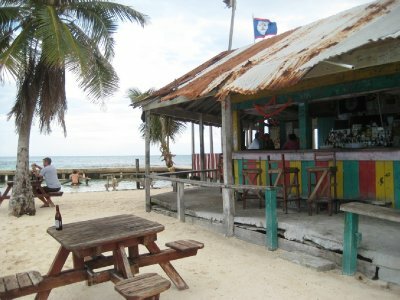 Caye Caulker, sunburns and cheap lobster dinners... Nice. 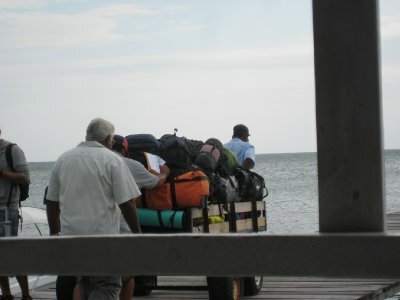 The next morning I caught the bus back to Belize City. This time I was on a BBDC bus. Similar to the journey up to San Ignacio, though without the radio (IFE is broken! I wonder if I can get 500 points?). Unlike the National bus, there was no overhead luggage rack, so my luggage rode up front with the driver. From the bus station, I got a taxi to the water taxi dock. $BZ 6 for the short trip. I threw my bag in the taxi’s trunk and climbed in. Upon arrival at the bus station, however, the driver encountered a small issue. The taxi driver tried to open his trunk to retrieve my backpack and said, "Oh mon, where is the string? I can't open the trunk without the string!" For the next twenty minutes, the taxi driver, myself and one of the workers at the water taxi company casually discussed options to get my backpack out of the car. Finally, the taxi driver pulled apart the back seat of his Toyota to get into the trunk and retrieve my backpack. By this point, I’d had my share of foibles on the trip, and was becoming quite relaxed about everything, so I wasn’t too fused about the lost 20 minutes. The great thing about travelling in a place like Belize, you learn to relax and take it all in stride. I wrote about this on my blog, where I learn to accept whatever comes. There are two ways to get to Caye Caulker - by air or by boat. A couple air carriers do the short trip from Belize City to Caye Caulker, and you can also arrange flights from other cities in neighbouring countries. I decided to take the boat, though. Something romantic about skimming across the top of the waves towards an island paradise. The water taxi costs $BZ 20 one way, or $BZ 35 return. The trip takes a little over one hour. 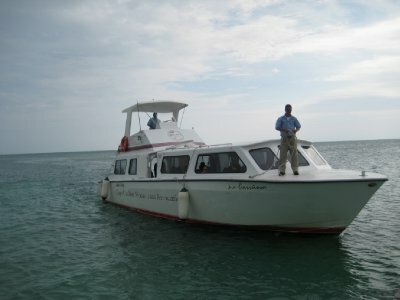 The ride is mostly smooth, as the water is calm - protected from big waves by the Belize Barrier Reef off the coast. There were a few big jolts, but that’s to be expected when on a boat. The boats aren’t really set up great to allow you to see what passes, with seats low in the boat. There are some seats at the back in the open air, but they fill up quickly and you do run the chance of facing a sudden rain shower, as we did. The folks in the exterior seats all tried to cram back inside the boat as soon as the rain starting pouring down. 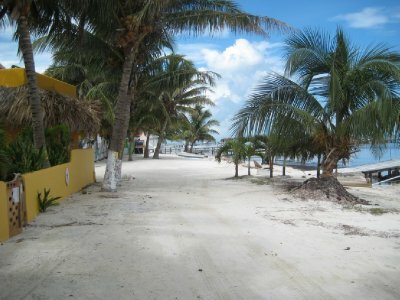 Unlike San Ignacio, I knew where I was going in Caye Caulker. Of course, its pretty easy in that the island is long and thin, and there is only a few roads that run the length of the island. 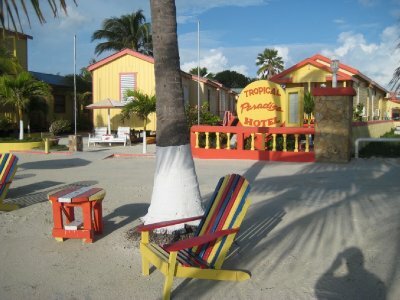 I headed from the water taxi dock south towards the Tropical Paradise Hotel, a well recommended location based on trip advisor and other sites. 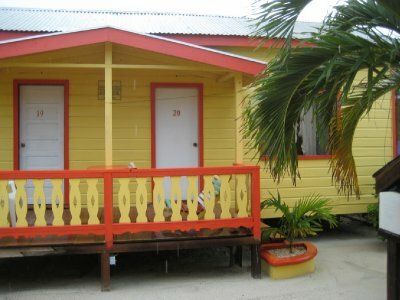 My cabana was $BZ 80 for a room with air conditioning, satellite TV, ensuite, and bar fridge. The hotel has a private beach and pier. There is a restaurant and bar attached, though I never tried it out. No complaints about the hotel. A good location, though the island is so small any place is a decent location. 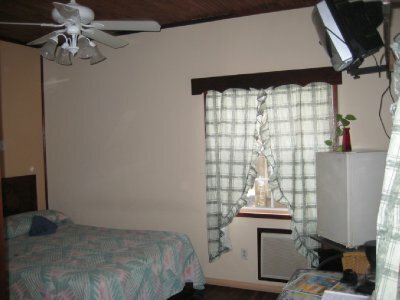 Everything in the room worked as expected, and hot water was plentiful. There are numerous tour guides available if you want to arrange a day or half-day snorkelling or diving. They also do sunset cruises for the romantically minded. I was just looking to chill out. I never tried out any of the tour companies, so have no recommendations. 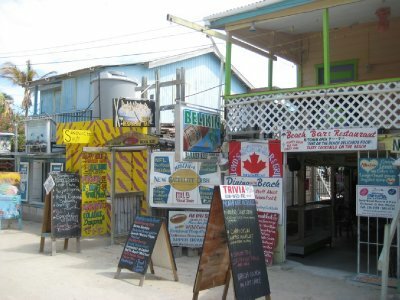 Seafood is the speciality of Caye Caulker. During the day, I grabbed a BBQ’d conch with rice and salad from the guy with the BBQ on the beach just north of the Sports Bar and Bamboo Bar. $BZ 14 for a full meal. Bamboo bar has good food with an ocean view and sand between your toes as you eat. $BZ 35 for a lobster dinner. Marin’s (close to the Tropical Paradise Hotel and beside the I&I Reggae bar) has excellent food, priced less than the beachfront restaurants. I had garlic shrimp for $BZ 20, which included chips and salsa appetiser on the house. For lunch, check out the sandwich place beside the sports bar. For $BZ 8, I had the most amazing cheese burger. Jimmy Buffet was jumping through my head! For drinks, the Lazy Lizard is a nice place by the split, and includes picnic tables in shallow water if you want to relax in the water. The Reef Sports Bar has TVs with American and European sports, in the event you want to catch up on your NFL, NHL or English Premier League while away. More on Caye Caulker on my blog, including my realisation that while the islands are a nice place to visit, I am probably not cut out for living the island life just yet. I caught the 8:30 AM water taxi back to Belize City. Checked in at the dock, provided my return ticket for inspection, and handed over my bag to be loaded at 8:00 AM. The Water Taxi showed up on time at 8:30, and we were away. Back to Belize City in just over an hour. I grabbed a taxi to the airport, this time putting my backpack in the back seat, rather than in the trunk. $BZ 50 to the airport. Checked in with Continental was quick, as there was only one person in line ahead of me. I did get four boarding passes handed to me, which was weird because I only had two flights. “I think Mr. Andrews-slash-Arthur would probably want these,” I said, handing back two of the boarding passes. The check-in agent sheepishly took them back. Security was quick - only two people in front of me. Past security there was a couple of shops - I bought two t-shirts as gifts ($BZ 20 each). For drinks or food, there is Jet’s Bar. While I had never been to Belize before, by the way I count having “been” to a country, I had spent some time at the Belize Airport when a flight to Honduras was diverted to Belize back in 2005 when the airport at La Ceiba was closed. All the passengers were let off the plane and into the airport in Belize City. We stayed 3 1/2 hours in Belize (beautiful day there, sunny and warm), but were not allowed to leave the international departures area. 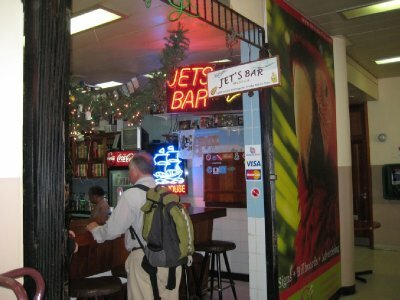 Therefore, most of the plane hit Jet's Bar in the airport. Jet's quite a character, a small man with a big presence. Most people ordered bottles of Belikin, a local brew. About 3 hours later, though, we had drunk Jet out of Belikin. Jet’s is still there, and still wandering around the airport trying to drum up business. I had a couple of Belikins before my flight. Jet is a small man - probably only five foot tall, if that. He has worked at the airport for years, and when the bar became available to buy, he bought it and renamed it after himself. He serves (according to him) the best rum punch in Belize, along with the best of everything else as well. I noticed, looking up at the pictures on the wall, that Jet has taken a lot of pictures with his patrons, and they often look very similar. Jet, hand outstretched in a thumbs up, his head resting against the chest of the prettiest woman in the group. I pointed this out to a couple beside me, a young set of honeymooners. To test the theory, they got a picture with Jet. The man tried to stand next to Jet, but Jet rearranged the picture, putting himself in the middle. He stretched out his hand, put his thumb up and tilted his head to the side until it rested firmed against her breast. Belize was an interesting place. I had my share of frustrations and troubles there - my frozen accounts, my backpack getting locked out, David’s Adventures issues with his truck, along with getting severely burnt after buying counterfeit sunscreen and cutting my toe open on broken glass. However, already these foibles are fading away, and I am left with a couple mental snapshots of my time in Belize. The smell of burning fields as the bus drove through the night towards San Ignacio. The water on my feet as I quaffed a Belikin beer at the Lazy Lizard on Caye Caulker. Dining on garlic shrimp during a thunderstorm at Marin’s restaurant. And most vividly, standing atop a Mayan temple, with no one else in sight, the jungles of Belize and Guatemala stretching out before me, with Duran Duran running through my head.